Professor Buhalis in his intervention he explained the need for the creation of digital hubs that will enable innovations in rural areas and minimise the distance from the global centres through technology. Creating innovative products and services through facilitating a bottom up approach to empower entrepreneurship and support sustainable development will enable the repopulation of rural and peripheral areas. Smartness and agility will empower the development of innovative ecosystems that can address different market segments and create resources for all stakeholders. Transport policy agendas have long sought to bring about more sustainable transport at tourism destinations. Whilst there are examples of successes, it remains unclear what inroads have been made towards creating a sustainable transport future. Policy directions have evolved over a number of years and in many tourism destination contexts, it is far from clear what a desirable transport future looks like. When translated to implementation, the aims of initiatives can be unclear and baseline measures inconsistent, making success difficult to judge. This paper analyses how sustainable travel has been implemented in practice at a destination level. The focus is rural tourism and data are derived from a specific case, the New Forest National Park, UK, where a wide range of transport initiatives have been implemented since the Park’s designation in 2005. The study adopts a social practice theory perspective. Data are derived from a visitor survey, interviews and observations. It finds there is scope to improve sustainable transport provision at destinations through understanding visitor practices, but limited scope to influence meanings associated with visitor travel and travel skills. Policy meets the needs of some visitors more than others. Angela Smith is a PhD student with a background in transport planning. Her research uses the experiences in the New Forest National Park to analyse transport practices and relative sustainability. Derek Robbins is a senior lecturer at Bournemouth University. Trained as a transport planner his research interests include the relationship between transport and tourism, tourism and climate change, sustainable transport policy and the cruise industry. 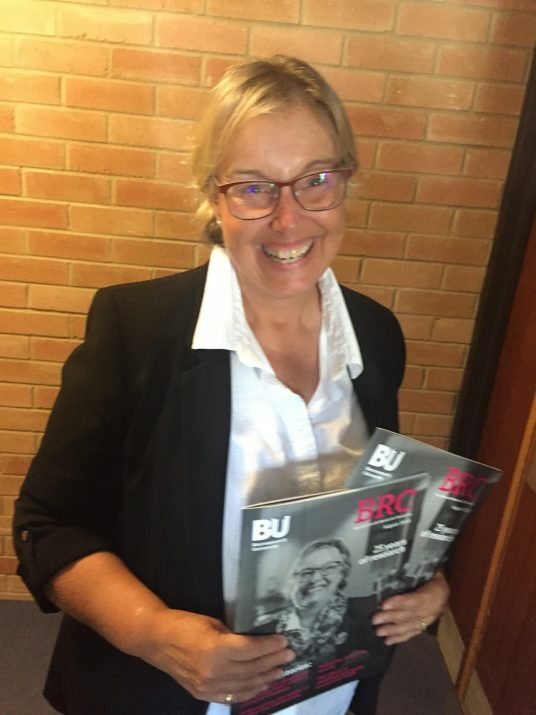 Janet Dickinson is a professor at Bournemouth University. Her research interests focus on tourism and climate change, the sharing economy, social representations and time. 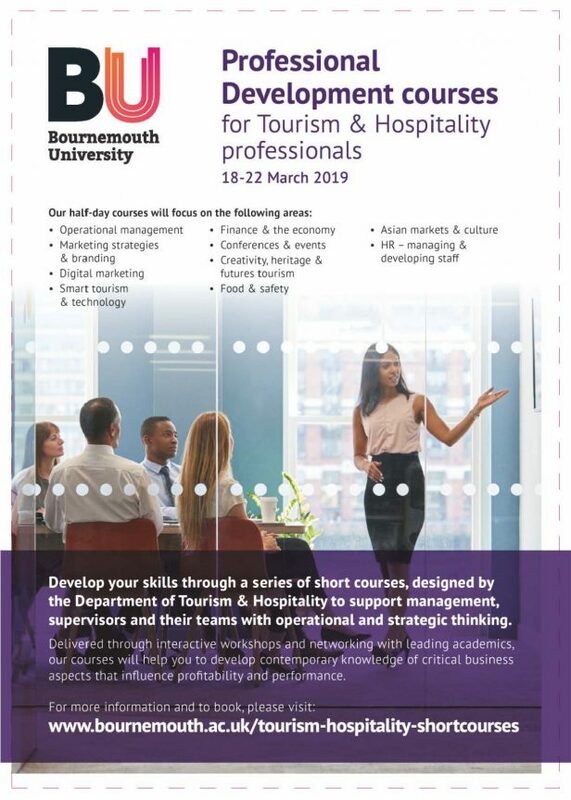 Join Bournemouth University Department of Tourism and Hospitality to learn how you can develop your potential and competitiveness through managing your staff, developing your product and service, understanding your customers and using digital marketing. You will also have access to our resources and networks to develop your competitiveness. The courses are delivered through interactive workshops and networking with leading academics and students and will support managers to develop contemporary knowledge of critical business aspects that influence their profitability and performance. 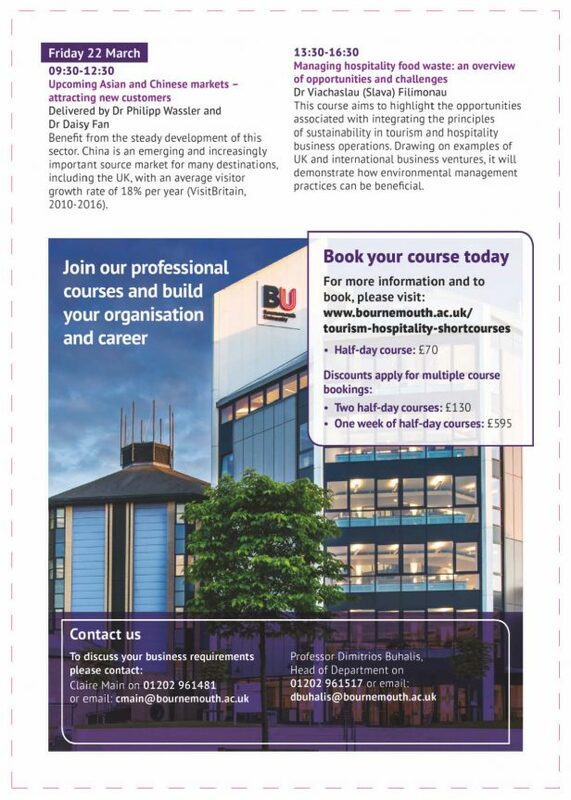 Part of our Fusion and BU2025 strategy at Bournemouth University the short courses run from 18 March – 22 March and can be booked individually or as a package at a discounted rate. Our series of half-day courses will be delivered through interactive workshops and networking with leading academics and students. They will support managers, supervisors and their teams in their operational and strategic thinking. New Paper Published – Volchek, K., Liu, A., Song, H., Buhalis, D. (2018). 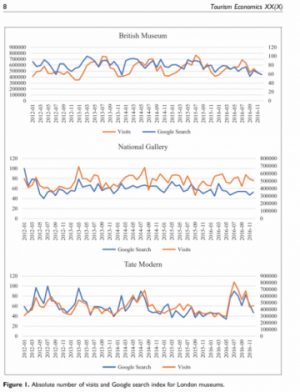 Forecasting tourist arrivals at attractions: Search engine empowered methodologies. Tourism Economics. improved at the micro level. 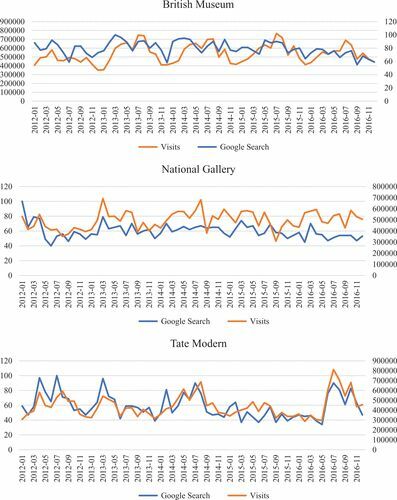 The number of visits to five London museums is forecast and the predictive powers of Naïve I, seasonal Naïve, seasonal autoregressive moving average, seasonal autoregressive moving average with explanatory variables, SARMAX-mixed frequency data sampling and artificial neural network models are compared. The empirical findings extend understanding of different types of data and forecasting algorithms to the level of specific attractions. 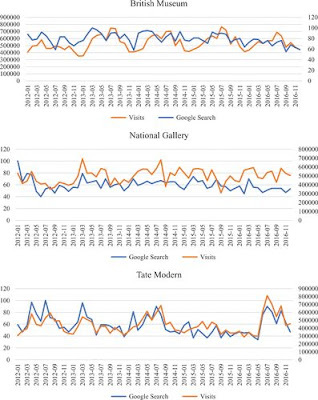 Introducing the Google Trends index on pure time-series models enhances the forecasts of the volume of arrivals to attractions. However, none of the applied models outperforms the others in all situations. Different models’ forecasting accuracy varies for short- and long-term demand predictions. The application of higher frequency search query data allows for the generation of weekly predictions, which are essential for attraction- and destination-level planning. View the full schedule of short courses and click below for more detail about each course. Please feel free to forward this email to interested parties. Our Professional development courses for tourism & hospitality professionals are primarily for our partners and help us to develop the competitiveness of the tourism and hospitality industries of the future. Join us to learn how you can develop your potential and competitiveness through managing your staff, developing your product and service, understanding your customers and using digital marketing. You will also have access to our resources and networks to develop your competitiveness. The courses are delivered through interactive workshops and networking with leading academics and students and will support managers to develop contemporary knowledge of critical business aspects that influence their profitability and performance. We pride ourselves on the cutting edge knowledge and professional excellence we cultivate. The combination of staff expertise and enthusiasm, knowledge excellence and co-creation with industry, generate innovation and best professional practice. 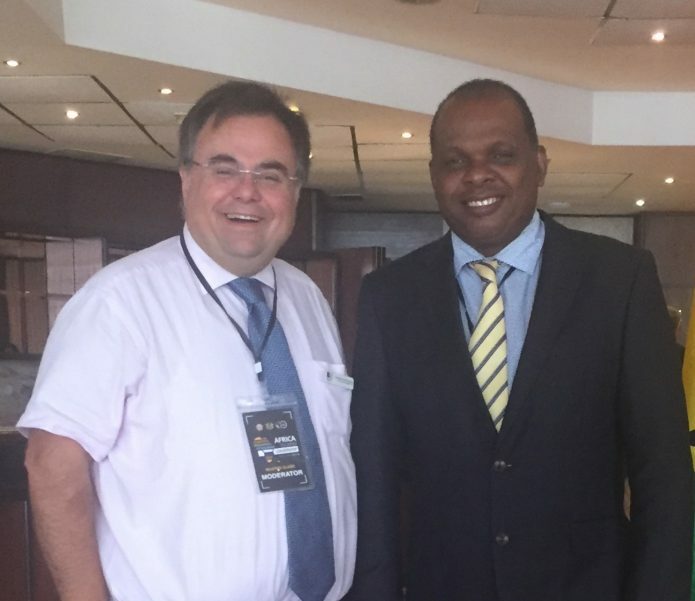 We have developed a suite of professional development courses for the tourism and hospitality industry to support managers in their operational and strategic thinking. They will bring you the tools and techniques to help grow your business. 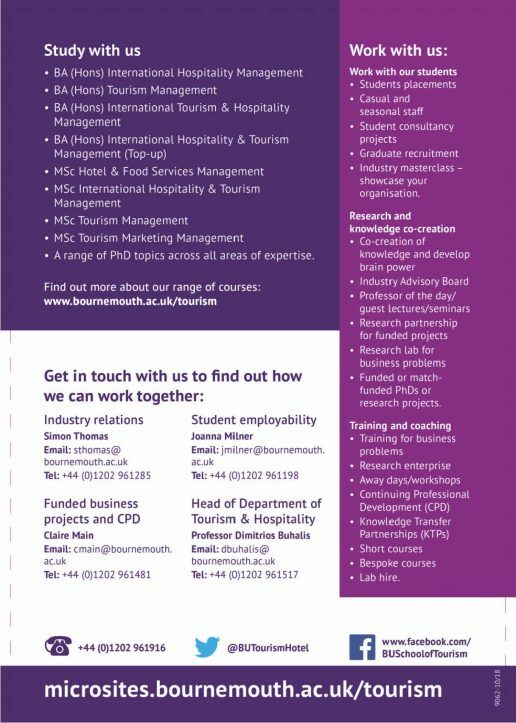 The Department of Tourism and Hospitality, Faculty of Management, Bournemouth University is a top university in the world for the study of tourism and hospitality, ranked 8th in the world for hospitality and leisure management according to the QS University Rankings 2018 and 12th in the world for hospitality and tourism management according to the Shanghai Rankings of Academic Subjects 2018 and 3rd in the UK for hospitality, event management and tourism in the Guardian League Table 2019. 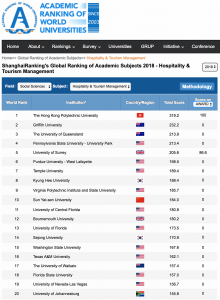 We are recognised globally as a leading contributor to knowledge creation and dissemination in tourism and hospitality. A team of 29 academic staff and over 1,000 undergraduate, postgraduate and doctoral students make us one of the biggest and most prolific departments in the world. The combination of staff expertise and enthusiasm, knowledge excellence and cocreation with industry, generate innovation and best professional practice. Our approach is about creating value with everyone we work with, locally and globally, and to share the benefits with society. Look forward to welcome you to our Professional Development courses. Good nutrition and eating well is an important part of public health and can help stave off a number of age-related illnesses. Over the last twenty years, Bournemouth University’s Professor Heather Hartwell has been carrying out research into nutrition in the context of developing large scale interventions to improve public health. Her work has taken her from prisons to hospitals to workplace canteens. When Professor Hartwell began her research career in nutrition, much of the health policy focus was on one-to-one support for people who were struggling with associated health conditions. The idea that large scale interventions might be successful was only beginning to be recognised. Alongside FoodSMART, Professor Hartwell and her team were also leading on another European grant, which was looking at increasing our protein intake through vegetables. In the context of an increasing global population, it is important for the agricultural and catering sectors to consider more sustainable sources of food. “The project was about encouraging people to get their protein through vegetables, rather than meat, which uses far more resources than arable farming,” says Professor Hartwell, “It’s a healthier way of meeting our protein requirements as vegetables contain less fat and are much more sustainable in the long run.” Partly inspired by the issues of sustainability raised in this project, Professor Hartwell and her team have recently started working on a new research grant with partners in Brazil to consider how to improve our long term food security. Submissions period 1 August 2019- until 1 September 2019. Branding originated as a means by which a company differentiated its goods and/or services compared to its competitors (Cowley, 1991). The importance of brand management in tourism and hospitality has become more important than ever as the sectors have become mature, global and highly competitive. Hitherto, the creation of strong brands was the result of passive or responsive marketing involvement by brand managers on consumers (Brown, Kozinets, and Sherry, 2003). Recent literature on marketing and brand management, however, suggests that strong brands are generated from a co-creation process, involving consumers’ active engagement (Boyle, 2007). For example, Coupland, Iacobucci, and Arnould (2005, p. 107) comment that “the consumer is an active partner with the marketer in brand-meaning formation”, whilst Brown et al. (2003, p. 30) note “the brand is a milieu where marketing management and consumer commitment co-exist”. Tourism and hospitality deal with experiential products and are at the forefront of cocreation (Buhalis &amp; Foerste, 2015) so that the integration of brand management and co-creation is now a crucial issue (Buhalis and Inversini, 2014). In terms of inseparability, one of the service characteristics, the service environment implies the involvement of consumers in the entire service process – including the production and consumption stages (Middleton, Fyall, Morgan, Morgan, and Ranchhod, 2009). Moreover, the development of information technology (e.g. TripAdvisor, Booking, and Expedia) facilitates the sharing of consumer service experiences and their positive or negative reflections as part of co-creation activities, which potentially informs brand development and reputation (Binkhorst and Den Dekker, 2009; Au, Buhalis and Law, 2014). Numerous studies in tourism and hospitality have discussed the brand management and co-creation, separately. However, academic attempts to integrate two important themes are more limited. Therefore, the purpose of this special issue in JPBM is to explore brand management and co-creation in tourism and hospitality contexts using a variety of issues/concepts/examples. We invite submissions on a broad range of tourism and hospitality branding topics in this regard, and welcome both conceptual and empirical contributions. 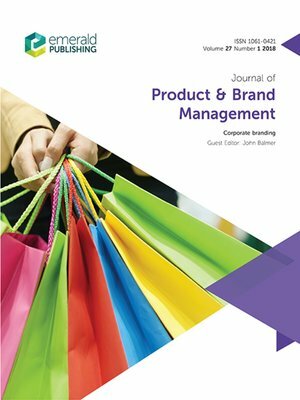 Full papers submitted to this special issue are subject to the standard review procedures and rules of Journal of Product and Brand Management. 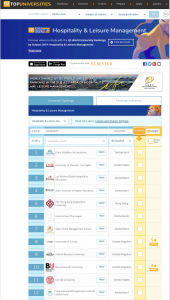 • Papers need to be submitted online to the Special Issue on “Brand management and cocreation: lessons from tourism and hospitality” through the ScholarOne System (http://mc.manuscriptcentral.com/jpbm). • For informal enquiries you can contact the guest editors. • Submissions will be blind-reviewed by at least two reviewers. • Based on the reviewers’ recommendation, the guest editors and the Editors-in-Chief will decide whether the particular submission is accepted as it is, revised and re-submitted, or rejected. Deadline for submissions 1 September 2019.The Scholar 1 site will not open for submissions until 1 August 2019. The site will remain open for one month until 1 September 2019. Submissions to the special issue can only be made during this window and should be made by selecting the special issue from the drop down menu which will become available on 1 August 2019. The planned publication is early 2021. Au, N., Buhalis, D., Law, R., 2014, Online Complaining Behavior for Mainland China Hotels: The Perception of Chinese and Non-Chinese Customers”, International Journal of Hospitality and Tourism Administration, 15, pp.248-274. Binkhorst, E. and Den Dekker, T. (2009), “Agenda for co-creation tourism experience research”, Journal of Hospitality Marketing and Management, Vol. 18 No. 2-3, pp. 311-327. Boyle, E. (2007). “A process model of brand cocreation: brand management and research implications.” Journal of Product and Brand Management, Vol. 16. No. 2, pp. 122-131. Brown, S., Kozinets, R.V. and Sherry, J.F. (2003), “Teaching old brands new tricks: retro branding and the revival of brand meaning”, Journal of Marketing, Vol. 67 No. 3, pp. 19-33. Coupland, J.C., Iacobucci, D. and Arnould, E. (2005), “Invisible brands: an ethnography of households and the brands in their kitchen pantries”, Journal of Consumer Research., Vol. 32 No. 1, pp. 106-13. Boyle, E. (2007) “A process model of brand cocreation: brand management and research implications”, Journal of Product and Brand Management, Vol. 16 No. 2, pp.122-131. Middleton, V. T., Fyall, A., Morgan, M., Morgan, M., &amp; Ranchhod, A. (2009). Marketing in travel and tourism. Routledge. 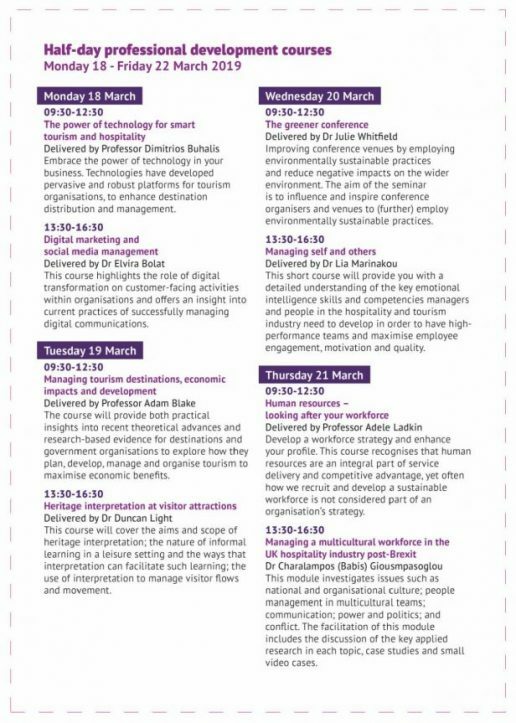 The Travel and Tourism Research Association’s 2019 European Chapter Conference will be hosted by Bournemouth University Department of Tourism and Hospitality in Bournemouth from Monday 8th to Wednesday 10th April 2019. This is a three-day conference that will include a doctoral colloquium day and industry best practice thread. The theme of the conference is Tourism in the Era of Connectivity, which covers a broad range of themes to ensure that we are inclusive of the widest range of tourism research. People-to-people connectivity is an essential aspect of tourism; bringing people from all aspects of life together to meet, share moments and explore cultures, resources and experiences. Connectivity brings us together through shared routes, accessibility, communication, and experiences in different environments and destinations. Increasingly, global society is becoming more connected, facilitating opportunities for exchange and interaction, bringing both opportunities and challenges. Tourism is changing dramatically in the era of connectivity. Advanced technology enables users to amalgamate information and big data from various sources on their mobile devices, personalise their profile through applications and social networks, and interact dynamically with their surroundings and context. Tourism professionals increasingly use technologies and networking to bring different stakeholders together to co-create value for all. 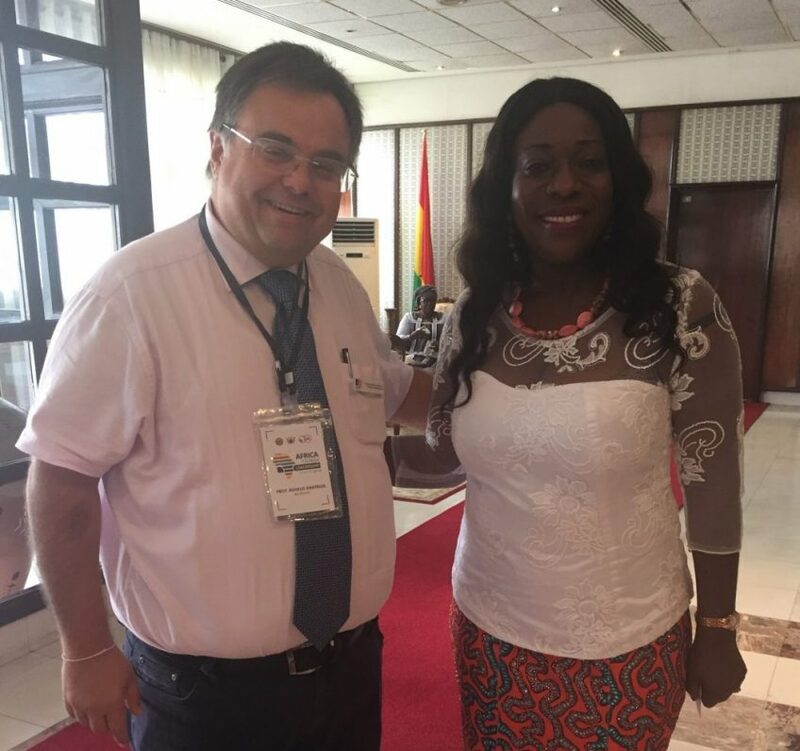 The conference will connect the different concepts of connectivity, personalisation, tourism development and marketing towards co-creation of the tourism experience. It will explore how these experiences can support the co-creation of value for all stakeholders and address a range of components of connectivity. 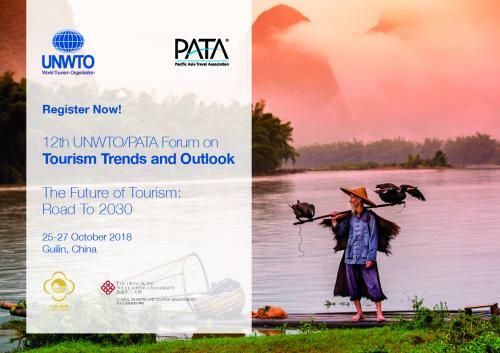 Coastal Tourism; Tourism Marketing; Economics and Planning; Culture and Heritage; Hospitality Innovations; Digital Tourism; Sustainability and Wildlife; Gender, Accessibility and Inclusion; Tourism Management; Overtourism; Tourism and Philosophy; Special Interest and Niche Tourism; Spiritual, Religious and Pilgrimage Tourism; Events and Leisure; Experience and Co-creation; Small Business and Entrepreneurship. Word limit of 1,000 words for extended abstracts; word limit of 5,000 words for full papers. Word limit includes references, tables, figures, etc. Please use Arial font size 12 throughout. Must be presented in MS Word Format, on size A4 (210 by 297 mm) paper, with margins of: left 3 cm, right, top and bottom 2.5 cm. Any illustrations should be of high resolution, preferably in JPEG or TIFF format. TITLE: In uppercase, bold, and centered. AUTHOR/ AUTHORS: in lowercase and the surname(s) in uppercase. AFFILIATION AND CONTACT DETAILS: in uppercase. CATEGORY: please indicate the paper category of the submissions (Research paper and case study; Doctoral research paper; Applied (industry/sector) paper; Student paper (for all students other than doctoral researchers)). TEXT: Arial 12, full justification and single spacing. Paragraphs will begin without tabulation and with single spacing with regard to the title or the prior paragraph. FIGURES AND TABLES: will be incorporated into the text in the corresponding place. They will be numbered separately (figures and tables) by order of appearance (Arabic numerals). The title, in bold and centered, will be located at the top and will be separated from the figure or table by space. FOOTNOTES: Please keep to a minimum. Where used they should be consecutive, with full justification and Arial 8 font. REFERENCE STYLE: please use the referencing style of the American Psychological Association (APA) Sixth Edition. Professor Cleopatra Veloutsou University of Glasgow UK and co-Editor in Chief of the Journal of Product and Brand Management.